With a 2 month rental with prepayment. 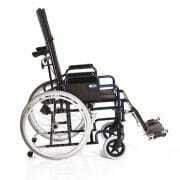 Folding wheelchair with reclining backrest. 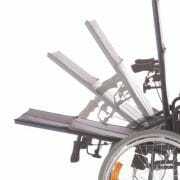 Self-propelling, with full rear wheels. 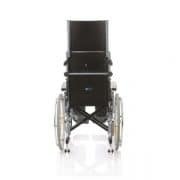 Recliner folding wheelchair with extended backrest.Made of painted steel, single cruise, seat and back in washable black padded nylon.Prolonged backrest adjustable in inclination by means of pistons.Removable backrest extension. Extractable PU armrests.Rear wheels in PU without air chamber (Ø 60 cm). Front wheels (Ø 20cm) in PU. Standard anti-tipping rollers. 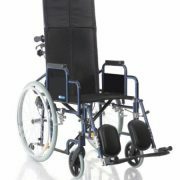 Height-adjustable, swivel, tilt-adjustable and adjustable lengths with height-adjustable head restraints.Mechanical brake on rear wheels and non-brake actuator. Available in different sizes.